ERCO "COMPREG" Propeller Blades Info. Home » ERCO "COMPREG" Propeller Blades » ERCO "COMPREG" Propeller Blades Info. Two types of plastic impregnated and compressed hardwood propeller blades were produced for use with Hamilton Standard propeller hubs for general aviation, military trainer and small transport planes. This vintage wood blade was the alternative for the shortage of Aluminum during the War times. The blades were divided into two groups, according to the hubs for which they were designed. Group 1 - 52" D size shank for Hamilton Standard propellers 3D40 (10 degree and 15 degree), 12D40 (10 degree and 15 degree) and 2D30 (10 degree and 15 degree) hubs. Group 2 - B size shank for Hamilton Standard Propellers 2B20 hub. Two of the *B* Shank blades were produced, the length overall of the blades were 44*" and 49* long. Two of the aircraft with the 2B20 and ERCO blades, 3086A (AAF42K18993) were the Stearman and the Stinson Reliant V-77 (Army AT-19) with the Lycoming R-680E3B engine, also the Jacobs, Wright and Continental, up to 285hp. The 2D30 could be used on models like the Howard and Beech Staggerwing with the 450hp R-985, Pratt & Whitney. The larger Hamilton Standard Constant Speed Hub, 12D40 and the 3 Blade 3D40, were used on the AT-6 and the R-1340 Pratt & Whitney. These engine and aircraft are some of the Type Certificate configurations for ERCO through 1946. COMPREG - The blades were carved from a laminated block of high density, impregnated and compressed wood called "Compreg". They were provided with tipping and a leading edge strip, made of sheet brass, which were attached by means of flush-head copper rivets, washers and brass sheet metal screws. the tipping and leading edge strips protected the propeller blade against abrasion and possible damage resulting from dust, pebbles and rain striking the blade. The ferrule was screwed into the blade and cemented permanently into place. It was made of alloy steel and served as a connector between the Compreg blade and the attaching parts of the Hamilton Standard Controllable Hub. The sleeve assembly consisted of a deep steel cup which contained two bronze bushings and a balancing bolt upon which balancing washers were fastened to obtain balance. This assembly was pressed into the ferrule and into a cavity bored into the end of the blade inside the ferrule. The seals were a synthetic rubber ring place on the ferrule, which prevented the leakage of grease out of the ends of the hub barrel. The thrust bearing assembly consisted of two hardened steel bearing races and a paid of bronze retainer halves, holding the bearing rollers. The function o the thrust bearing was to transmit the centrifugal force of the blade to the hub barrel. This type of bearing permitted blade rotation in the hub with minimum friction. The retaining nut was an alloy steel nut, which screwed onto the ferrule, holding the sleeve in place and provided a seat for the thrust bearing. The retaining nut was machined for indexing the blade to the pitch changing mechanism. On the D-size propeller blade an indexing key was provided for this operation. Two lock-pins of alloy steel locked the retaining nut in place on the ferrule. The following historical excerpts are taken from the book From the Ground Up: The Autobiography of an Aeronautical Engineer, by Fred E. Weick and James R. Hansen, Smithsonian Institution Press, Copyright 1988. Not long after work on the ERCO airplane was under way in 1937, the author, Fred Weick was asked by Henry Berliner to visit Europe to learn as much as possible about the design of a new type of wooden propeller that was being manufactured by the Schwarz Company in Germany and by Airscrews Ltd. In England. ERCO had sold many of its machine tools for the construction of aircraft to most of the major European countries, but in Russia and Germany the company could not receive payment that could be transferred into American dollars, instead, it had to make some sort of barter arrangement. From Germany, it got the right to make Schwarz propellers, which were being manufactured in large quantities not only by Schwarz but also by Airscrews Ltd in England. The Schwarz blade consisted essentially of a main core of laminated spruce or other light wood, which merged into a root of impregnated and compressed hardwood known as “compreg”. The compreg root was threaded and screwed into a steel ferule that supported the blade in the hub. The remainder of the blade was covered completely with a heavy coating of reinforced cellulose acetate sheet, whose leading edge was armored with a flush strip of metal. Thus, the wooden core was well protected against contact with pebbles, winders, sand, rain, hail, seawater and so on. These propellers are described in detail in a paper entitles “Composite Wood and Plastic Propellers Blades” by Fred E. Weick that was printed in the SAE journal in June 1939 . The main advantage of the Schwarz propellers lay in their light weight, as compared with the large aluminum-alloy propellers which at that time were being used with the most powerful reciprocating engines. Up to 1936 ERCO had never been involved per se in building airplanes, but its products had consisted entirely of machines for making airplanes. These machines included propeller-profiling machines, sheet-metal flanging machines and stretch presses and the automatic punching and riveting machines invented by Lee Marchant. Soon after Mr Weick’s return to ERCO and finishing his report, ERCO got the Schwarz-type propeller activity under way. As time went on, ERCO made quite a fair number of large propellers of this type, mostly for experimental airplanes, because the props were light and could be designed and manufactured quickly, requiring no special tooling. Hollow steel propellers soon dominated this market, though. The only real quantity production of propeller blades at ERCO occurred during World War II when they manufactured quite a number of all-compreg blades for adjustable-pitch propellers used on planes like the Stinson L-5 Grasshopper reconnaissance plane. By January 1941, nearly a year before the United States entered World War II, manufacturers could get no more aluminum-alloy sheet or even aluminum-alloy extrusions for use in small commercial airplanes. The nation’s entire production of these items was being used for military purposes, either to build up our own forces or to help those who would later be our allies. Erco’s main production during the war was in machine-gun turrets. 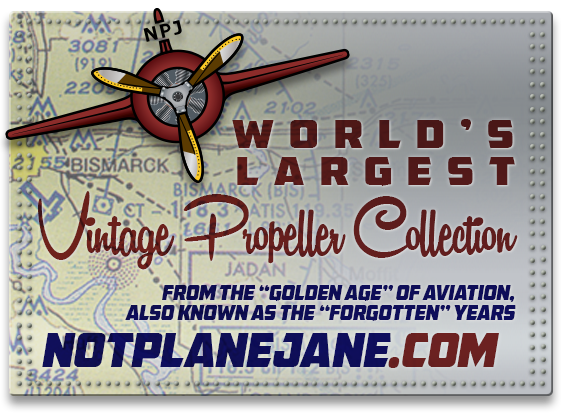 They continued the production of propellers, but the output consisted mainly of all-compreg blades.